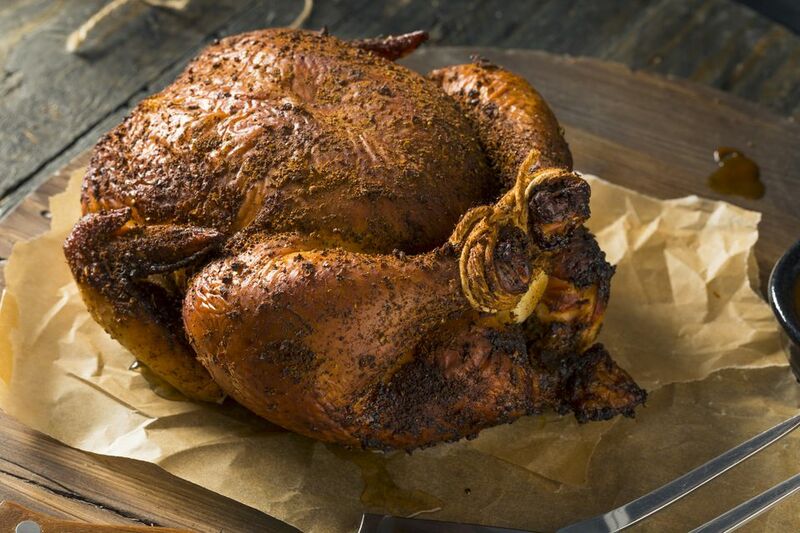 This is a great smoked chicken recipe with tons of flavor that can be prepared either in a smoker or on a grill rotisserie. The result you can expect is chicken so tender you'll be able to lift the meat from the bones. Rinse chicken under cold water and remove any excess fat or hanging bits of skin from the outside. Make sure the cavity is well cleaned out. Pat chicken dry with paper towels. Rub with lemon juice and salt. Mix bread crumbs with garlic, pepper, tarragon. Stuff chicken to 1/3 full and add the whole lemon. Add remaining stuffing. Let sit in the refrigerator for 2 hours. If smoking, prepare smoker with fruitwood chips and add chicken when coals are 80% white, and cook for 2 to 3 hours. If grilling, preheat the grill with fruit wood chips, place chicken on rotisserie rod (some of the filling might come away during grilling) and cook for 1 to 1.5 hours, or until internal temperature of chicken (particularly in the thigh) reaches 175 F.
Once cooked, remove from heat and tent with aluminum foil. Let chicken rest for 10 to 15 minutes. Remove stuffing and lemons. Carve chicken and serve with your favorite sides.